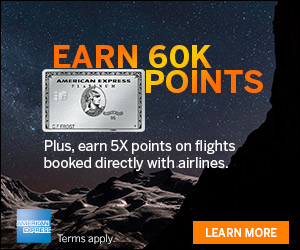 American Express has come out with another 100,000 bonus point offer for the Platinum American Express credit card. But this time the offer appears to be a public one. The offer was too good to resist and I applied for the card even though I received a bonus for the American Express Business Gold offer in recent months. In this post I’ll share the results of my experience applying for the card. Update: 100k Offer is no longer available. The offer from American Express is for a 100,000 Membership Reward sign up bonus after spending $3,000 on the card within 3 months of sign up. But what I like the best about this card is the sign up bonus and the ability to transfer the points into programs like British Airways, Delta and others. To alleviate this concern I did two things. First, I confirmed with American Express that a person who received a bonus with a Business Gold Card in the last 12 months still qualifies for a personal card offer. Once I got that out of the way, I took screen prints of all of the terms and conditions and then applied for the offer. After about 30 seconds my eyes lit up with an approval for 100,000 Membership Reward points after spending $3,000 on the card in 3 months. This is a great way to start the day and I’m swimming in American Express Membership Reward points from all of the 100,000 Business offers I’ve received in the past few months. Hat tip to Lucky at One Mile At A Time via Travel Summary. What are your thoughts on applying for the card? 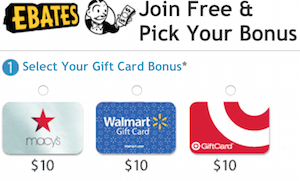 Are you excited to get the bonus points and what do you think you’ll do with them? I’m excited about the offer but I’m also worried that they may not honor it even though I have screen shots. Your thoughts if they will honor the bonus. Just signed up and got an approved message. 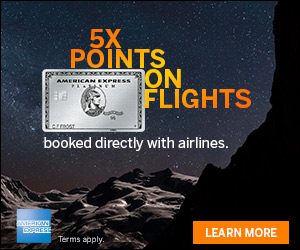 In your opinion which airline transfer give the most bang for the buck for 100,000 amex points? Hi Pete – I can’t say for certain. But the offer terms were very clearly presented to me at the time of application. Hi Johnny – It depends. Right now there is a 30% transfer bonus to British Airways, which is good for short haul flights but not as great for long haul flights. To provide a better answer one would have to know your airport and where you’d like to travel within next year. With the timeline of the application, I do not think you will be able to obtain two $200 credits for airline incidentals as the annual fee will hit on January 1, 2014, right? I just completed my last app-o-rama on Saturday! I might just try to throw this in the mix! It is really hard to pass up, but I am close to my max ability for minimum spend… The signup bonus gods are laughing at me right now! Do you think that someone with a Delta co-branded Amex Gold card would be ineligible for the bonus offer – or do the terms just mean a plain Amex Gold card? I don’t think we will be able to make the deadline for the 30% bonus avios, am I incorrect? How often do they do bonus for avios?? Also, can we make it to get $400 credit given we applied yesterday? I read that it transfers to Singapore airline??? How does this compare to getting the ba card with 100k miles and hitting the $30k spend for a year to get the companion pass? I got in on this offer this morning but realized that it’s only been 2 months since I cancelled Premier Gold AMEX. Think they will honor the offer? Or should I just cancel my application and hope for another offer later. I have the Mercedes Benz Plat card currently which I don’t think is a problem.